Zal Batmanglij’s The East arrives on Blu-ray and DVD today and we are celebrating by giving away a copy of the film on Blu-ray to two of our Way Too Indie readers. 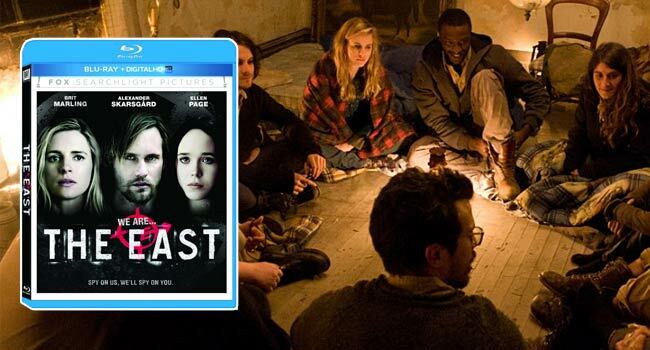 The East follows an ambitious new recruit (Brit Marling) on her first undercover assignment to infiltrate “The East”, an activist collective that terrorizes corporate leaders who commit crimes against humanity. The film is Batmanglij’s follow-up to his directorial debut of Sound of My Voice which also starred Brit Marling. Step 2: Leave a comment on this page telling us what your favorite spy film is. * Additional chance to win: Follow @WayTooIndie on Twitter and tweet at us: (your favorite spy film) “@WayTooIndie http://way2in.de/east”, to enter. The film is said to be inspired by Zal and Brit’s experience of spending some time with an anarchist group briefly during the summer. Lending to that experience were the various eco-terrorist groups and movements in the northwest, such as the Earth Liberation Front. Starting in 1992, ELF as its known began in United Kingdom and quickly spread throughout Europe into the US. Here are important facts you need to know about ELF and its part for inspiring the film, The East. ELF was founded in the UK, in the city of Brighton by members of a group called Earth First (EF!). Earth First! was described as a movement and quickly notes it is not an organization. EF developed a popular reputation of not overtly breaking any laws in their protests. This led to the creation of ELF, as it was called for those that chose to carry out extreme measures. The ELF garnered national attention with a series of events, most notably, the burning of a $12 million ski resort in the wealthy and famous Vail, Colorado. The reason behind the attack is said to be primarily because the resort was set to expand their property, which in turn, would ruin the last lynx habitat in the state. In a release to the press, it’s stated the elves expressed that business ahead of Colorado’s habitat would not be tolerated. Much like the film, the group called themselves ‘The East’. The ELF is also known as ‘Elves’ or ‘The Elves’. The exact definition is the autonomous individuals or covert cells “economic sabotage and guerrilla warfare to stop the exploitation and destruction of the environment”. Gaining notoriety for its abrasive and destructive tactics, ELF became the subject of the world news and the film world alike. A Sundance winner and Academy Award nominated documentary, If A Tree Falls, investigates the movement through the eyes of one of its members, Daniel McGowan. The documentary includes rare footage and interviews with members of the cell during the height of the movement from 1995 to early 2001.